For Duckburg historians we got two important stories in the new issue of Donald Duck (IDW’s #11/legacy #378). 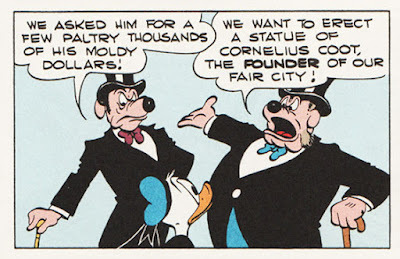 In The Incredible Quest for Cooties we get new information about how Cornelius Coot founded Duckburg. 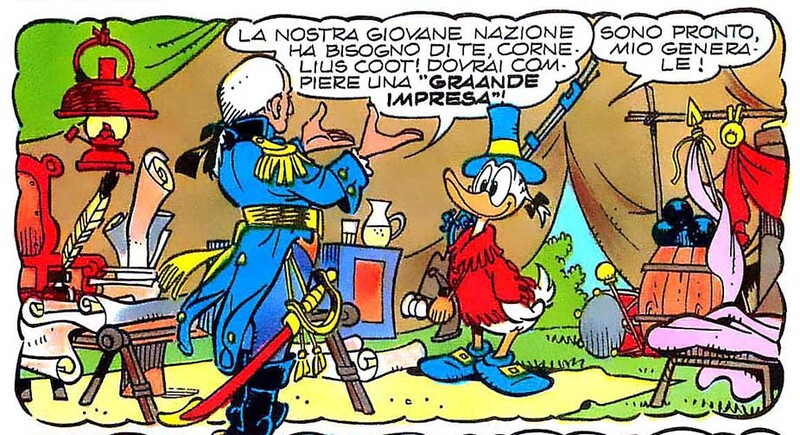 Information that is quite different from what Don Rosa told in His Majesty, McDuck. First we get to know that Cornelius had a brother Johannes, then we can read that Duckburg was founded in the 1600s. And judging by the outfit and Pilgrim hats (also seen on the usual statue) they seem to be European pilgrims. The names of the ships, Ye Quackflower and Ye Duckwell are also references to the first pilgrim ships Mayflower and Speedwell, where Mayflower was the only one to end up crossing the Atlantic. 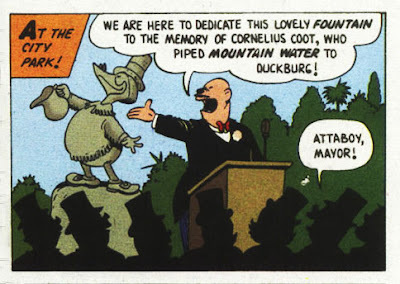 From "Sufs in Your Eye"
But back to the Cornelius Coot history; in the crosstalk page we can read "Duck storytellers from Louisville to Rio have told how Coot settled the city in 1818… or was it 1518? Or 1718?". The first reference is to Don Rosa’s story about how the British fort Drake Borough became Fort Duckburg in 1818, but I'm not sure who the Rio storyteller is — or where the other dates are from. 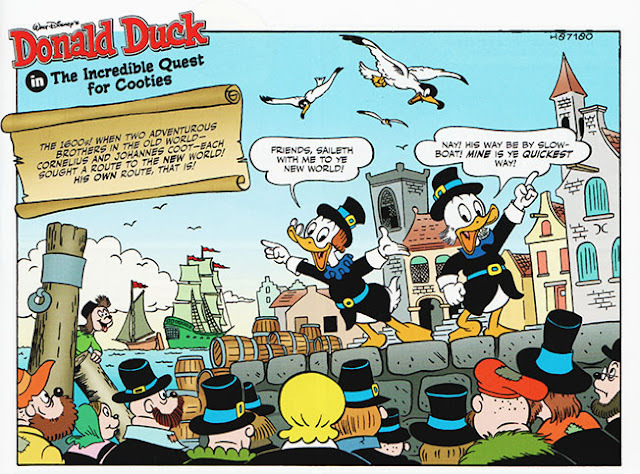 A Invasão Dos Piratas with the description "Pirates invade Cornelius Coot's Duckburg". Seems to be part of a "History of Duckbrug" series. A Herança De Cornélio Patus with the description "Daisy finds out that a pioneer woman helped Duckburg's foundation". I haven’t read those two stories, so I have no idea if they are the ones being refered to in the crosstalk page. Does anyone know? But here are some other stories with historical details about Cornelius Coot and the founding of Duckburg. We first get to know about Cornelius Coot in a statue contest in WDC&S #138 (1952). We also see him as a snowman in WDC&S #196 (1957) and as a statue in WDC&S #201 (1957). This is probably the best known foundation story. From Cornelius Coot’s own diary we get the story about how the British Fort Drake Borough became Fort Duckburg in 1818. The story is inspired by the true story of Sir Francis Drake who landed in California in 1579 and claimed the land. 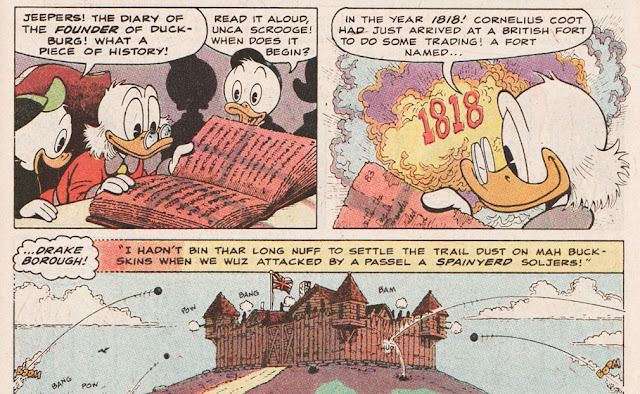 In an earlier story by Don Rosa, when Scrooge buys the deed from Cornelius’ descendant, it’s said that Cornelius actually built the fort. 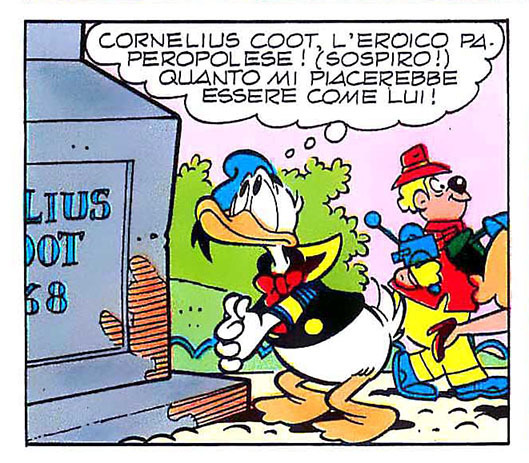 From "Last Sled to Dawson"
In "Nuts on the Family Tree" we can read (Nowegian translation) that Cornelius was "digging Duckburg out of the wasteland". To Scrooge the founder is a big hero, and a historian tries to find out if Scrooge is related. During the story we get to see several of Scrooge’s other ancestors, but the historian found no relations to Cornelius Coot. Scrooge’s secretary/butler however turns out to be a direct descendant of Cornelius! 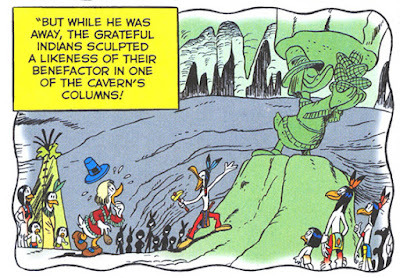 We find out that the Duckburg landmark statue is based on a sketch from another statue, found in a cave. From "The Lost Treasure of Cornelius Coot"
Brother, Can You Spare A Pot Of Gold? A pot of gold that Cornelius got from a leprechaun helped build the city. From "Brother, Can You Spare A Pot Of Gold?" 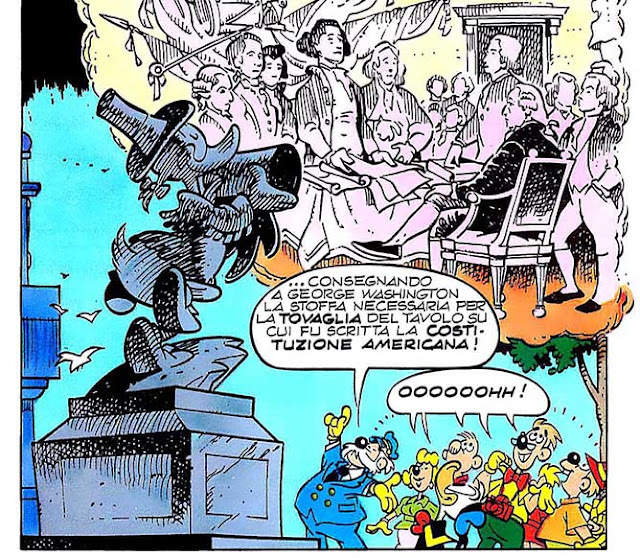 Paperino e la "graande impresa"
Cornelius helped George Washington getting the fabric used as tablecloth when signing the Declaration of Independence. Part of a date (68) is visible on the statue. From "Paperino e la "graande impresa""
Do you have any idea what the sub covers are about? All three publications "DONALD" "UNCLE SCROOGE" "COMICS AND STORIES" and "MICKEY MOUSE" have a snow monster theme cover. I can't find anything on the net about them. Do you have any clue? "Fort Duckburg is mentioned in The Money Well": it's also mentioned in three other Barks stories: "Migrating Millions" (W US 15-05; referred as "an old fort"), "War Paint" (W US 30-02) and the script-only "Duckmade Disaster" (drawn by Kay Wright as W JW 14-01; later redrawn by Daan Jippes as H 92001); "Duckmade Disaster" has several menntions of Cornelius Coot. A statue of Cornelius Coot is also seen in Barks/Jippes' "Hark, Hark The Ark" (D 2005-051); remake of the Barks/Wright version (coded W JW 23-01) where the statue doesn not appear. I am not sure if the statue was present in Barks' script or if Jippes added it. On an unrelated topic: do you have the Dutch story about Donald's 80th anniversary? 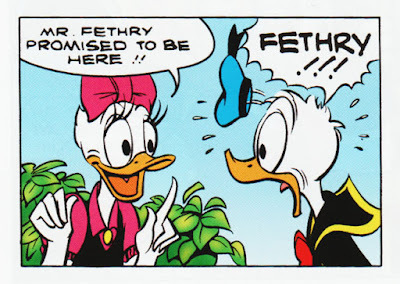 I would like to see the whole 5-page sequence with Della Duck. Thanks for this summary of Barks-stories. I forgot all about "Duckmade Disaster" and had to re-read it now :) In the story they find the real site of Coot's old homestead, that has been buried under the city dump since 1882. Finding Coot's city dump cabin reminded me about another story too. In "Ol' Swimming Hole", archaeologists end up finding the ruins of Coot's hidden cabin in the forest. Sorry, I don't have the Dutch "80 jaar" story. I hope it'll be reprinted in English at some point. "Thanks for this summary of Barks-stories": it was a pleasure. Unfortunately, Inducks has a policy of not indexing charcaters that are only mentioned, so neither version of "Duckmade Disaster" lists Cornelius Coot even though the whole story is about saving his home place. Barks also drew the Cornelius Coot statue in a few paintings. Too bad you don't have the Dutch "80 jaar" story, but hopefully someday I will find someone who has it. It won't be easy, as it was only printed twice (2014 Dutch edition and 2015 Brazilian edition). 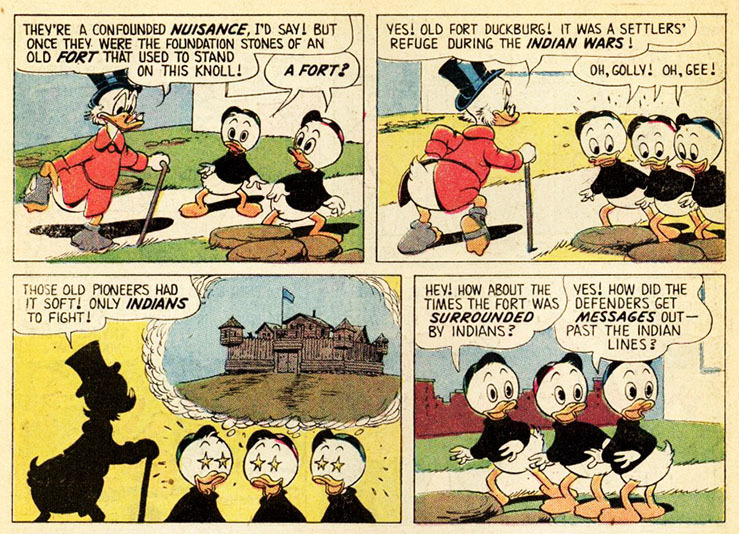 where Huey Dewey and Louie try to follow Cornelius's path through America from the West coast to his arrival in Duckburg. Very nice to have this list of stories that include or refer to Cornelius Coot, thanks to you and your commenters! The plot of "Nuts on the Family Tree" sounds clever, as a story that preexists the Rosa family tree which makes Grandma Duck, Donald, Della, HDL, Gladstone, Fethry and even Gus Goose descendants of Cornelius. Basically, almost everybody *but* Scrooge! I doubt that "80 Jaar" will make it into English. There's probably a reason why it hasn't been printed in other languages--sounds like it's a bit of a mess (I say this as a big Geradts fan!). And the plot point that Donald is *actually* 80 years old (as I understand it) would not fly with many fans. But perhaps just the Della section will be reprinted in English translation, if there's ever a place to do that. 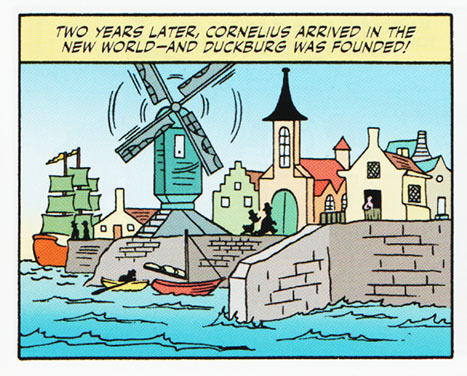 Brasilian story "A Invasão dos Piratas" establishes Duckburg already existing in 1789 and Cornelius is an old man at that point. It also establishes there's been population in Duckburg (depicted as somewhere between the East Coast of America and Brazil) since the good ol' stone age. "Very nice to have this list of stories that include or refer to Cornelius Coot, thanks to you and your commenters! ": it's good indeed to have this list of stories with Cornelius Coot, though Inducks lists 100+ stories with him, and we now that list is incomplete, so a single blog entry can't include them all. ""I doubt that "80 Jaar" will make it into English. There's probably a reason why it hasn't been printed in other languages--sounds like it's a bit of a mess (I say this as a big Geradts fan! )": well, it has been reprinted in Brazil in 2015 but unfortunately this second edition was also the last. I hope there will be a third edition someday, no matter in which language, as this increase the chance of seeing scans of the Della portion online. "And the plot point that Donald is *actually* 80 years old (as I understand it) would not fly with many fans": I totally agree, in a story featuring somehing as important as the story of Della and and even an appearance by her in the present, it would have been better to leave out all the fourth wall breaking, as well as all those appearances by random Disney character who shouln't even be in the same universe as Donald. 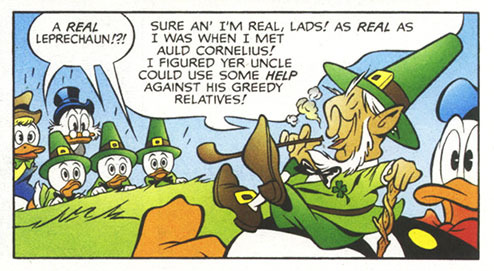 I also wish the story showed the return of HDL's father too and followed the indications of Taliaferro regarding how the boys went to live with Donald. "But perhaps just the Della section will be reprinted in English translation, if there's ever a place to do that": I hope so, though it would also be good to have it in any language as long as we can all see it. I am a little disappointed that the worldwide duck fandom hasn't managed yet to find scans of the scenes with Della. Sure, there are pictures of this or that bit, but not (to my knowledge) the whole sequence. "And the plot point that Donald is *actually* 80 years old (as I understand it) would not fly with many fans": I totally agree, in a story featuring somehing as important as the story of Della and and even an appearance by her in the present, it would have been better to leave out all the fourth wall breaking, as well as all those appearances by random Disney character who shouln't even be in the same universe as Donald." I don't think the "80 years" business is supposed to be a fourth-wall breaking. They are just rolling with the “official”, Don-Rosa-notwithstanding version that Disney characters are still alive today. Those are not RANDOM Disney characters. They're all the Disney characters that back in the days of Western and Gold Key had been incorporated as comics regular, like the Song of the South cast or Madam Mim. I believe that those characters kept appearing in Dutch Disney comics up to this day, and that officially they are part of the same universe as Donald Duck and Mickey Mouse, in their continuity (which I agree with, by the way: it opens so many possibilities). "I don't think the "80 years" business is supposed to be a fourth-wall breaking": well, I haven't read the whole story, but since Donald is clearly stated to be a fictional character then I'll say the story is definitely breaking the fourth wall. "Those are not RANDOM Disney characters": I know that in some old and lesser known stories there were weirdnesses like Grandma Duck interacting with the mice from Cinderella, Dumbo, the Big Bad Wolf... but this doesn't make similar crossovers less silly in my opinion, not to mention that Robin Hood and Peter Pan and other characters really feel out of place in the Donald Duck universe. But that's just me. How is he firmly stated to be a fictional character? Couldn't whatever makes you say that be consistent with "The Man Who Drew Ducks" (e.g. 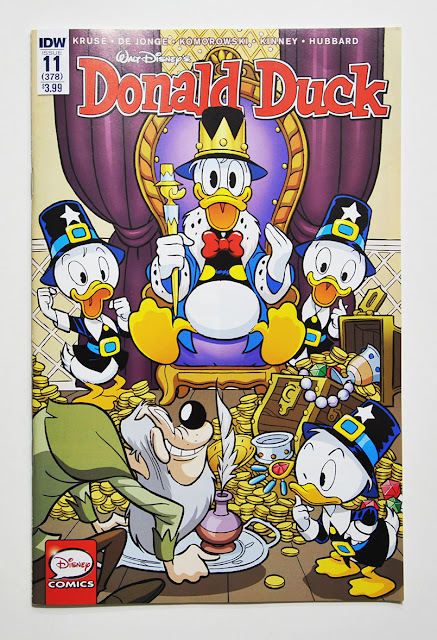 Donald lived real adventures but the comics do exist as accounts/retelling of those real events)?